This buddha is going to be a sureshot spoiler in the coming election. In case NDA don't get full majority (which is likely case), this buddha will come out and present himself as acceptable secular thobda; which in turn make other parties to pressurise BJP to consider him as PM for further support. If not him, this buddha will take name of Sushma Swaraj and other parties would agree to it. Tough road ahead for Namo. NEW DELHI: BJP appeared to be bracing for fresh turmoil in the run-up to Lok Sabha polls after L K Advani expressed disinclination to seek re-election from Gandhinagar in Narendra Modi-ruled Gujarat. Although the central leadership turned down the request and sought to put a lid on the matter by announcing Advani's candidature from Gandhinagar, the party leadership was keeping its fingers crossed. According to late-night reports, Advani has indicated that he would rather wait for the party central election committee to respond to his request to contest from Bhopal. Advani's desire, conveyed to BJP chief Rajnath Singh on Monday, to switch constituencies came as a surprise to the party because of his consistent public stand that he would fight only from Gandhinagar: the constituency which he has won since 1991. He had stated this as recently as on February 28 when the party announced its first list of candidates. The decision of the central election committee came after day-long drama that seemed to bring to the fore the bitter resistance of a section in BJP to Modi's leadership. The saffron senior kept away from the deliberations on the ground that his candidature was under discussion even as reports swirled through the day about his reluctance to contest from Gandhinagar. After the committee's meeting, senior leaders Sushma Swaraj and Nitin Gadkari met Advani to convey the party's decision. General secretary Thawarchand Gehlot soon announced the decision to signal that the nomination for Gandhinagar, so far as the leadership is concerned, was a closed chapter. Yet, there was wariness about what Advani might do, with party circles speculating whether the Madhya Pradesh unit may recommend him for the Bhopal seat. Amid growing uncertainty, Modi had a meeting with RSS chief Mohan Bhagwat at the Sangh's Jhandewalan office in the capital. Several assumptions were being put forward in party circles for Advani's desire to move away from Gandhinagar after having often emphasized his closed links to Gujarat, saying his family had settled there after moving from Karachi and it was home. Many in the party felt the attempted switch was meant to signal his autonomy of Modi and to emphasize that he could win from any constituency of his choice. With Madhya Pradesh already playing host to Sushma Swaraj, who represents Vidisha and whose equations with Modi are seen as tense, the desire to move to Bhopal was also suspected to be an attempt to raise a parallel axis vis-a-vis the ascendant troika of Modi, party chief Rajnath Singh and leader of opposition in Rajya Sabha Arun Jaitley. Party circles have for some time sniffed an effort to set up MP chief minister Shivraj Singh Chouhan as a counterpoint to Modi. The tussle in the party over Modi's projection as PM candidate saw Advani suggesting that Chouhan's performance as CM surpassed Modi's as Chouhan had turned around Madhya Pradesh which, unlike Gujarat, was a BIMARU state. Some in the party also saw the move to shift constituency as reflective of Advani camp's fear that his campaign may be subverted by workers who may look to proactively scuttle any post-poll trouble for Modi. Although Modi camp would have ensured that Advani won comfortably to ward off the charge of sabotage, workers remain apprehensive of the intent of Modi's opponents in the party. Madar is not getting it.. Now RSS had to step in and kick his balls.. Pencho u r going to be 91 by end of this LS term, u want to breathe your last in LS or what? He had better fall in line as he has no cadre support left either.. Becoz of this rascal and his wing congress neednt ever lose heart. Somebody please tell the election dates. For the last one year, ever since the BJP began inexorable moves to make Narendra Modi its mascot for 2014, we have seen only one side to Lal Krishna Advani: the Big Sulk. The man widely credited with the rise of the BJP in the late 1980s and 1990s has been unable to put personal pique aside in the larger interests of the party. He has repeatedly tried to queer the pitch for Modi’s rise instead of being his prime support and cheer-leader. While at a personal level one can understand Advani’s disappointment that he will always remain the BJP’s best man and never its groom, surely, at 86 years of age, he cannot seriously harbour any great visions of what the future holds for him. The latest drama over whether he will fight the Lok Sabha elections from Gandhinagar or Bhopal is further evidence that the BJP’s tallest leader is shrinking in stature, and he is the one doing it to himself. Having sought to fight from Gandhinagar as recently as January, he now says he wants to shift to Bhopal – a move that cannot but lead to speculation about his equation with Modi. In order to give Advani space, the party, in fact, moved Modi to Vadodara when it could have chosen Ahmedabad East for him. But Advani remains in sulk. The only thing he will achieve by seeking to contest from Bhopal is sharpening intra-party factionalism by propping up Shivraj Singh Chauhan of Madhya Pradesh against Modi. One can only suspect that Advani is very cut up with Modi, and does not want to be beholden to him for any win from Gandhinagar. So, this is clearly more about Advani’s personal grouse than anything else for Modi has not done anything overtly to undercut him. However, one cannot rule out an underlying battle of egos here: having been Modi’s mentor and backer all through till last year, Advani may be expecting more reverence and more payback from Modi. But Modi’s personality is not the type to kowtow and self-efface. In fact, there is good reason to presume that he has a strong ego of his own – and may not be willing to make the first move to placate Advani. But beyond this obvious clash of egos, one cannot but lay the fault more at Advani’s door. For several reasons. First, if he is not in contention for power, he ought to have accepted this reality and played statesman and mentor to whoever the party anointed as its prime ministerial candidate. But Advani thinks he should play favourites: he has thus been using proxies like Sushma Swaraj and Shivraj Singh Chauhan to stem the Modi tide. Second, even assuming his personal equation with Modi is not good, it does not automatically follow that he must play spoiler to Modi’s growth plans. Modi’s rise is due to the groundswell of support in his favour among the party’s grassroots. 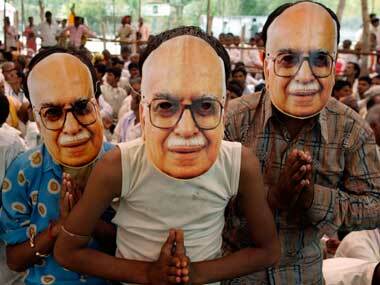 Just as Advani was BJP’s man of destiny in the 1990s, today it is Modi. Advani’s inability to accept this shift in equations is what is at the root of his rift with Modi. Third, outside a dynasty, power is not conferred from above. It comes from one’s ability and track record. Advani’s mistake is to believe that Modi’s rise was due to his support – which was crucial at critical points in Modi’s career - when the reality is that Modi’s current popularity is purely the result of his own efforts. History shows that power is usually not the result of charity from above – and former mentors usually have a falling out with their protégés at some point (eg: Kamaraj with Indira Gandhi, NTR and Chandrababu Naidu, Pranab MukherjeeMamata Banerjee). Mentors have to ultimately give space to their mentees and move into the background. Else, they lose their moral standing. In September, when the party wanted to officially nominate Modi as its prime ministerial candidate, Advani & Co tried to stall it by saying the party should wait till after the assembly elections. The RSS and the BJP clearly saw through this ruse, for had the party waited, and the BJP had won three states, Advani would have pushed the candidacy of Chouhan – and put the party in a quandary. The party did right to squash Advani’s efforts to create a rift before the Lok Sabha elections. Now that the party says he can fight from Gandhinagar, he wants to go to Bhopal. Whichever way this controversy ends, one thing should be clear to everybody: Advani is a bitter man and uncomfortable with his own growing irrelevance. He ought to have accepted his reduced relevance with grace; he is choosing to play sourpuss instead. In the process, he is hastening the arrival of his own irrelevance. Everyone knows that he is not the key to the BJP's future any more. All that's left is a strong memory of the man who built the party and is now playing party pooper. Last edited by ungalprasad; March 20th, 2014 at 01:38 AM. Advani is scared he will lose from Gandhinagar as Gujarat BJP workers will deliberately take badla for opposing Modi's PM candidature last year.. Some think he wants to take control of MP's bjp unit by running from Bhopal.. If BJP get less numbers he will take control and try for himself or Sushma or Jaitely as PM. Jaitley is NaMo man. Susu is Advani camp.. The old bafoon will live till he's 105. He's like that Kesubhai Patel. Also, the barbs by the Kangrace that "he is the eternal PM in waiting" are also hurting the poor soul. People have to learn to let go especially when age is not on your side. NaMo wins once again. After the BJP gracefully offered to field LKA from wherever he wanted, LKA settled on Gandhinagar. So now, NaMo is more 'accommodative' than LKA. But the latest crap is about the slogan of 'Har Har Modi, Ghar Ghar Modi' that's caught the imagination of the Banarasis! It seems 'Har Har' makes NaMo into 'God', the equavalent of Mahadev?!?? Sathiyana to hota hai 60 mai, yeh 80 mai Assiya gaya hai Buddha.. This buddha is going to be a sureshot spoiler in the coming election. The old bafoon will live till he's 105. People have to learn to let go especially when age is not on your side. If Advani is so bad why don't they simply kick him out? Why is BJP tolerating him? Isn't there a great Modi wave on? The truth is BJP needs Advani and not the other way round. thats for BJP to decide.. you can eat your face in the meanwhile. BJP is a national party because of Advani. He worked really hard to bring BJP to where it is. Modi would still be peddling Tea were it not for Advani.. so guys if you are a true support of BJP.. you would not use the derogatory terms on Advani. but its time for him to count his days not dream of scuttling BJP's path to Delhi.. if this kind of factionalism is encouraged by Advani.. BJP will sit in opposition for another 5 years and then break into pieces. Straight and simple nobody quits by themselves.. need a push. Advani finished himself when he praised Jinnah to paint a secular picture of himself.. this undid all his personal good deeds. From then on, he's an ordinary leader. Being a Non-Resident Bhopali , I can understand why Advani wanted to shift to Bhopal . There is a significant populations of Sindhis (5-10%) settled in Bhopal and BJP has not lost this seat since 1989 . Even if they field a statue , he will win from there . However, Central leadership should have avoided all these squabbles . Advani & Jaswant are senior enough to be given the choice of where to run from especially when Modi is running from 2 seats of choice, Rajnath singh - who presideded over BJP's decline in UP - has run away from Ghaziabad and conveniently chosen Lucknow displacing resident MP Lalji Tandon and known defectors from Congress have been instantly rewarded by being given seats of choice to run .